Utilizing a combination of aerodynamic shape and fin stabilization technology, First Strike paintballs maintain their velocity longer. The result is twice the range and unrivaled accuracy. Finally players have an alternative to accuracy by volume or backspin gimmicks that simply change trajectory. Become one of the first true paintball snipers with First Strike. 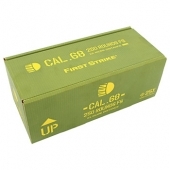 Can be loaded individually into most paintball markers for unparalleled range and accuracy. Can be magazine fed with the Tiberius T8.1, or any Tiberius T9.1 FS marker. First Strike Rounds There are 3 products.